How to show our PASSION as teachers. Teaching is hard. But it is also very satisfying. Most of us probably became teachers because of a passion -- for the subject, for the students, for the joy we feel when students succeed. I'm getting ready to lead a workshop for a junior and senior high school. One sub-topic is motivation. As part of that, I'm thinking about how teachers from various subjects can share their passion. 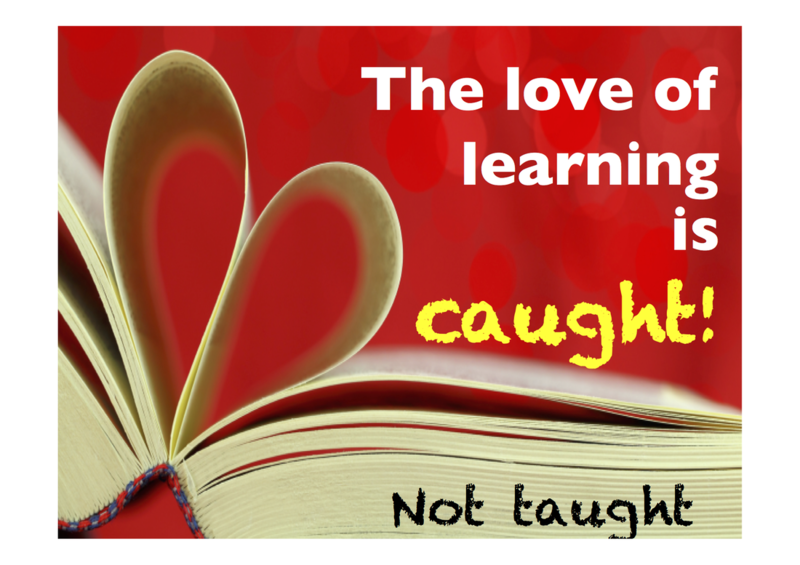 (The idea being that their students can "catch" the love of the subject and learning about it from their passion. I started a conversation on Facebook. I explained the situation and asked people what they did to share their passion. I'm an English teacher so a lot of my friends are English teachers, too. I specifically asked for ideas for other disciplines. I thought some of the suggestions were great. Those ideas are listed below. 3 ideas before I get to them. I'm you have ideas you want me to add, send them to me. (see "Contact Marc" to the left. I have another webpage that lists links for English teachers working with non-majors. There are links related to about 10 majors other than English. Click HERE for that page. If you happen to teach science, Nature Springer has a site where you sign up for a daily short email with several interesting science newstories. Click HERE for Science Briefing. (I'm an English teacher but I read this every day. Many of the stories are fascinating. Consider starting the same kind of conversation on your own social media. You probably are connected to friends/colleagues who have ideas related to your field. Here are ideas that people posted on Facebook. Thanks to everyone who took part. •Do something (ANYTHING) once a week that shows your passion about your subject. • tell them why you decided to teach English/math/science/PE, whatever. • tell them about your own struggles with the subject – and how you overcame them. • search the internet for "funny (math) jokes" and tell a joke. • search for "amazing (science) tricks. • search for "cool (history) facts". Would value any ideas. One problem with my ideas here: they all sort of assume a kind of outgoing teacher. Are there other ideas for more reticent people. Thanks in advance. Jason Walters One thing I’ve thought about doing is establishing my own “lending library” for other teachers- I’ve got shelves full of great resources that I feel I should be sharing! I like to build things. I use my classroom as a platform to make websites, write stories and create games that my students get to troubleshoot for me. Students have suffered from too much input. Sometimes I enhance learning-autonomy and independent learning by getting students to make posters, interview others out-of-classroom, collect data and present their findings. Dexter Da Silva Nice focus, Marc. Showing / sharing your passion is a old constant for me in my teacher education classes. Many of my students choose teaching as a career based more on 1 and 2. The content for many of them is not a passion, but a necessity or important thing. But over their 3 years or teacher training they sometimes find that their love of children or of helping children learn / develop can help them develop or discover their passion for English / kokugo (the two areas my students major in). I guess I'm suggesting expanding your focus of passion from "subjects" to include "people" and "process/mastery/competence/being better/personal bests/. Marc Helgesen Great point, Dexter. Those might fit into my "why did you become a teacher" point. I'll give it some thought. Thanks. Greg Brooks-English Share your personal thumbnail sketch of your evolution of being a passionate teacher and how you notice how you feel when you do something in your classes and that informs direction; get students to tell stories about passionate teachers they've had or passionate experiences related to some kind of subject. Board games!! My stock answer to most educational dilemmas!! Within the modern board game industry there is something that will cover every subject! Marc Helgesen This is interesting, Douglas. Can you give me some examples? Marc Helgesen OK - here we go. For mathematical/logical reasoning there's Stone Age (resource management / simple division / problem solving) Love Letter (16-card logical reasoning game (Japanese designer)) King of Tokyo (probabilities). For Geography, anything with a map so 10 days in ... series, Ticket to Ride (various countries) Risk! (old favourite)! Historical games include Civilization (bg of the comp game) 7 wonders (easier version) Trans Atlantic (history of steam ships!) Trajan (Roman empire) etc. Most of these games are fairly main stream with video play throughs or "how to play" vids online. There are so many more!! Airlines Europe includes shares (as does Acquire). CV is a game where you make up your life. It's kind of cool. 1. Write the CV for the ideal <insert subject area> teacher in Viet Nam. 2. Share with other people. 3. How can targeted skills be taught. Puzzles. I love logic puzzles as a form of mental exercise. One of the struggles of teaching classes with mixed abilities is that often I need to slow down for the less able students and repeat myself, and so the top students feel bored. So I put a fun word or logic puzzle up in the corner of the board every week and they get bonus points for solving it. They come to me after class to confirm the solution and get their points. It gives the top students something to do when the class drags a bit as I explain something to the students who need help. A few times I've been surprised by a student I thought was lower level solving the puzzles. Regardless though, it gives me a chance to talk to the students about something we both like doing. Jason Peppard I do riddles as a warm up, split half style. Dictate the riddle, give them time to think about it, and give the solution at the end of class. Students love the challenge, and it teaches how ambiguity works in language. Robert Dickey For those who had careers previously, why they gravitated to the classroom, and never left. Because (usually) the pay was better elsewhere! Adam Jenkins Math joke: How can Halloween = Christmas? Robert S. Murphy the numbers of letters -- how long will typical Japanese students take to get it (if you've used it here)? Now you know who puts out their Christmas lights for Halloween: mathematicians! Leonie Overbeek Passion does not have to be a razzle dazzle. Be consistent with rules, be respectful to others, show respect to the things around you, and demand the standard of excellence you set for yourself from the students, not to impress you, but to build their own self respect. Adam Jenkins Passion for e-learning: stems from the unlimited opportunities e-learning provides educators to rickroll their students! I'm surprised by how few Japanese students know about and use podcasts. There's a great way to learn about nearly anything. The University of Osaka has a great set of French podcasts! Eric Reynolds To your point about the introvert/extrovert continuum. Have you read Parker Palmer? The courage to teach? Perhaps a more important question for me would be: How have you, in your daily practice, been yourself in ways that involved some risk to yourself, but provided opportunities for your students to grow? now I will have to think about that. Language learning histories and teacher learning histories! Part of why I teach are the students so sharing their triumphs seems like one place my passion would naturally come through. Last semester my students made so many awesome projects making alternate endings/prologues etc for books they read in ER. Another is the camaraderie of fellow teachers, especially my colleagues in JALT. Their ideas have inspired me to try lots of stuff in the classroom. I sometimes talk about the background of how I came to use a certain activity in class. Where I first learned about it, what my hopes are for it in class. Another is just the wonder of language. It’s like a puzzle that’s always growing and changing. How the same phrase could mean different things. “I’m cold” could mean help”but it could also mean you want to get closer to someone. What else could “I’m cold” mean? In what situations? A couple of years ago my wife showed me this blogpost where the directions for making yakisoba were rewritten in different authors’ literary styles. It’s amazing how many ways you could basically say the same thing. Be seen. Many non-tenured teachers I see often either stay in their labs or go off campus after, sometimes between, their classes. Some tenured professors are the same, they tend to prioritize life outside the university even though they may be at work during the day. Yet, if students do not see you around, you are less likely to stick in their minds. Be social. Approach students outside of classes. Greet them, eat in the cafeteria, sit outside in the good weather and take an opportunity to talk with them in English. When students get a chance to talk to us without the barriers of rows of desks our interactions are much more stimulating. I wonder in other universities whether these points hold true? Maybe it is just my environment that has led me to this conclusion. Caroline Handley For subject it would be easy to learn one new thing about your subject and share it once a week, maybe to start the 1st class each week. For introverted teachers remind them that just tiny things like smiling, remembering student names, gesturing when speaking and saying bye to individual students as they leave the room show you care. Also my students write in notebooks which i grade a few times a semester (full points if all the work is there and shows some effort). If i ask them to write about themselves in a task I try to comment on the content. Glenn Amon Magee When I was doing part-time work in hotels I would often seen a mirror by the door to the customers area. Above the mirror was the message 'check your smile.' I liked this so much because staff would actually do it before they went out through the door. Sharing metaphors for the classroom with students through stories: the round table where we come back from various adventures and tell stories...make up songs or raps...I often catch students' enthusiasms for ex last term they were all into manga and anime so I asked them to make ppt stories mixing characters from different genres. ​Greg Brooks-English As a teacher that got caught by climate change, I specifically used games and role plays in class to motivate my students. It's had a big effect in that student get tons of interactive talk-time and are internalizing lessons in memorable, fun and oftendramatic ways. Some games include 'The Mystery of the Three Scary Numbers (MTSN)' [give clue(s) to each student and have them complete questionnaire to help them solve mystery which is relationship among 2C warming, carbon budget of 595 Gt, & burning global carbon reserves of 2,975 Gt], 'The Yonsei International Campus Climate Change Conference (YIC3C)' [each student is assigned role of someone impacted by climate change on Earth and must answer 8 questions before end of class exercise], and a game called The Thingamabob Game (TTG)' which deals with capitalism & the climate where students most often choose collective suicide over preserving a livable planet; this last one stimulates lots of deep introspection and class conversation!!! Marc Helgesen THANKS for all your wonderful ideas. I think I want to put this list on a webpage (so it will be easily available. Does anyone object to me listing your names? If so, please let me know and I'll blur them.